Tired of Choosing Paint Colors the Hard Way and Paying for Color Mistakes? Want a Faster and Easier Way to Find the Right Paint Color? Shortcut to the "Right Answers"
Voted "designers' best kept secret"
You don’t understand why you have to go through all that trouble when all you need is a "simple" beige/gold/green/blue/etc - shouldn’t there be an easier way? Your husband is starting to lose his patience and wants to know why it's taking you so long to pick a color, and when you will stop wasting money on the samples? Meet the Paint Color Cheat Sheets™ ...and Me. Hi, my name is Yelena Kublitski and I am the creator of the Paint Color Cheat Sheets™. I created this system to help you find the right paint color for your home, easier and faster. It's a shortcut to the best, timeless, most popular Sherwin Williams paint colors that I have personally proven, tried and tested in real life. 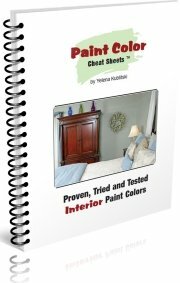 I called it the Paint Color Cheat Sheets™ - with the idea that now you won't have to wade through hundreds or thousands of paint colors anymore, in order to find the right one. I've done all the hard work for you, eliminated all the wrong options and narrowed down the choices to only the best few (like the "right answers" in a paint color deck). In other words, the Paint Color Cheat Sheets™ give you as close to foolproof and no-fail colors as you can get without days or weeks of choosing. No more endless testing or second-guessing your choices. Simple. Fast. So you will spend less time choosing paint colors and more time actually enjoying them in your home. Initially I was intending for my collection to be solely for my own personal use. But then I started sharing it with our customers (my husband and I run a professional, full service house painting company and offer color consultations), and they all encouraged me to turn it into a "real" product and make it available to everyone who might need it. It took me 7 years of trial and error to compile this collection. I had to make a LOT of (costly) mistakes, waste thousands of dollars and go through hundreds and hundreds of paint colors, before I found the ones I could really call "foolproof". That’s right - most of the colors you see in a paint color deck will never make successful wall colors - because they are either too dark, too intense, or just plain wrong otherwise. And it’s not just my opinion. In fact, all experienced professional decorators and color consultants have a "go-to" file that consists of a small number of colors they refer to again and again in their work. For example, there are colors that look merely ok, some that always disappoint when they go up on the walls, and then there are foolproof colors that work in all homes and all situations, producing consistent, reliable results every time. And those are the ones I’ve included in my Paint Color Cheat Sheets™. "You Can't Go Wrong with These Colors"
Yelena Kublitski's Paint Color Cheat Sheets™ are a great tool that will save time, money and many headaches - because you simply can't go wrong using any of the colors suggested in her well-edited palette. Her colors are nature-inspired: earthy reds and oranges, grayed blues, greens and purples with brown undertones - colors you'll often see in historical collections. In addition to a well-edited palette of colors, she's provided a wealth of information in her bonus tutorials that will help you from start to finish. She's even included a 'Paint Color Schedule' used by professional designers, architects and color consultants to effectively communicate your paint selections to your contractor or paint store clerk. You won't have to re-invent the wheel and go through the same learning curve I did in order to figure out what colors really work. I’ve done all that for you. I took all of my secrets, "go-to" color files and notes, and turned them into an easy-to-use, comprehensive resource that lets you find that perfect paint color in minutes - instead of days (or weeks). It contains just enough colors to give you a healthy range of options, but not enough to overwhelm you. "It Takes a Lot of the Guess Work Out"
Many homeowners that I meet with worry that they won't like the colour once it's on their walls. The information included within the Paint Color Cheat Sheets™ addresses that concern. One of the features I like best about this product is that it takes a lot of the guess work out of colour selection for a homeowner by providing suggested colour pairings. With the Paint Color Cheat Sheets™, you will achieve designer quality results every time - because you will have in your hands the same colors that designers charge hundreds of dollars to recommend. This will give you an almost unfair advantage over your friends - while they’ll still be choosing, testing and experimenting, you’ll be enjoying your beautiful home with your family! "I Found It to Be Just What I Needed." I am in the middle of renovating our house and like many people do not have an eye for color. 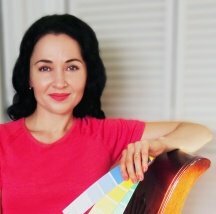 With Yelena's guides I am able to know what colors are best in which rooms and what colors will make those rooms go from ordinary to extraordinary. I highly recommend her guides and have made it a shortcut on my desktop. She has certainly lightened my load in this renovation process and I am truly thankful and appreciate all of her hard work that she put into her guides. I love it. Yelena, you outdid yourself for our benefit. Thank you. Have you ever picked a paint color that seemed perfect on a swatch, but ugly on the walls? Maybe a "soothing" shade of green that turned out a mint toothpaste green, or a "cheerful" yellow that ended up looking so crazy it hurt the eyes? Then you already know that a pretty paint chip doesn’t always make a pretty wall color. But with the Paint Color Cheat Sheets™ you will choose with confidence and rest assured that the colors you pick will be guaranteed to look great, with no surprises when applied to the walls - because I have personally tested them all. "It Took All That Thinking Away." I really love the Cheat Sheets, because the colors are suggested for you with advice on where to use them. It took all that thinking away. This product has so many great tips too, and the recommended resources are packed full of valuable information. It will save you a lot of headache on returns and time. And to top it off Yelena is the best most helpful person. It's a totally new approach to choosing paint colors, where the entire process (picking, previewing and even sampling the colors) is done in the comfort of your own home, from start to finish. You will only need to go to the paint store once - when you're ready to buy the paint. The process is fast, easy and won't cost you anything - not even for the samples! "What Yelena has Come Up With Should Eliminate a Lot of Testing." Specific colors have been selected for rooms and even coordinating accent colors to go with them, to help you complete your design project. This product will help you choose colors with assurance and be happy with the decisions for a long time, without the help of a designer. Your painting projects will be much easier on the planet, too - you will not generate all that paint waste from samples (that will clutter your garage for years, and eventually end up in the landfills). You won’t contribute to the air pollution either, because there will be no need to drive back and forth multiple times from your home to the store and back again, trying out different colors. The Paint Color Cheat Sheets™ will help you pick the right color the first time around. "The Cheat Sheets Helped Us Finally Decide and Agree on a Color"
We've been trying to choose a paint color for our bathroom for 5 months now: we have an idea about what colors we like, but when we get home it looks completely different on our walls than on the color charts in the store. The Cheat Sheets helped us finally decide on a color, and we also realized our mistakes. Thank you for saving us time and the cost in unused paint that we would just throw in storage with the other 12 cans that were the wrong color! What Exactly Is In the Paint Color Cheat Sheets™? With these proven, tried and tested colors that always work, you will create and enhance any decorating style, mood or atmosphere - from traditional to contemporary, from bold and funky to tranquil and sophisticated... and everything in between. You can buy these paints directly from Sherwin Williams, or any other professional paint store can match them for you, free of charge. You don’t have to have a good eye for color or the ability to see color nuances and undertones, because I’ve done it all for you here, and described each color the way a color pro sees it. That way you will know what to expect - because when it comes to color, the best surprise is no surprise! You will get recommendations for complementing colors, and know what colors go with what, so you can mix, match and coordinate your decor with confidence. The lighting in your home can "make or break" paint colors. So here you will learn what lighting conditions each of the colors needs to look its best. That will help you decide if your room will actually lend itself to the color you have in mind. Also, you will see which color is appropriate/in harmony with what room, so that there will be no conflict between the color and the room's function. These charts are the condensed version of the Paint Color Cheat Sheets™ - so you can see all the colors at once. They are convenient to use and easy to print out for quick access (but only if you want to - there's no need to print out the Cheat Sheets™ in order to use the system). Even though I've made everything as simple and intuitive as possible, I've also created this mini-guide to help you get the most out of the product. It also includes tips and tricks of the trade, quick and easy fixes, and additional free resources for decorating with paint. You will get 6 best paint colors that both your kids and you will love. No more crazy, neon-like walls to cramp your decorating style! These colors are bright yet livable at the same time. They are fun, happy and playful, but without going over the top. No one will have to compromise now. Here you will find 6 best paint colors for babies’ rooms. No matter if it's a boy or a girl, these soft, soothing, delicious pastels will provide the perfect intensity of color to make your baby interested in his or her surroundings, but without over-stimulation. Guaranteed to make your baby smile! You will also receive 9 best colors for front doors. These rich, deep and gorgeous jewel shades will improve the curb appeal of your home, and produce a great first impression on your guests or potential buyers. After all, your front door is the first thing everyone sees - make it count! This handy little sheet will help you plan your entire house painting project, and keep track of all the colors and finishes you decide to use in your home. So when it comes time to go to the paint store or call your contractor, you will look and feel efficient and organized, and avoid silly mistakes. I priced this product so that anyone who needs it can afford it - because I believe that a beautiful home shouldn’t cost a fortune. And if you’ve always dreamed of hiring a professional color consultant but could never afford it, now you will become one - at least for yourself! Because if there ever was a way to "borrow" good taste, competence and expertise when it comes to paint colors, this is it. So instead of spending $150+ for a single color consult, the Paint Color Cheat Sheets™ will let you give yourself countless "color consultations" - all for that same $47 that you only have to pay once. No matter how often you repaint, you will refer to it again and again, but still will never run out of colors to try. Just imagine how much money you will save on all that gas and paint samples (don’t forget your time, energy and sanity as well). ...because you have to pay twice - to fix the wrong color! So if you’ve ever had to repaint the walls because of a color mistake, you will especially appreciate this product. Ready to finally create a home you'll be happy to live in and proud to show off to your friends and in-laws? No need to pay for Shipping and Handling! The Paint Color Cheat Sheets™ come in a digital, electronic format - a downloadable Adobe PDF file that you can view and read on your computer. That means you can get started right away! As soon as you complete your order, you will be taken to a secret page with simple instructions to download the Paint Color Cheat Sheets™ and all of the 5 Bonuses. Your order is 100% safe and secure - pay with PayPal or any major credit card now. NOTE: this product is appropriate ONLY for homeowners who live in the United States or Canada. P.S. Your friends will think your wall colors have been selected by a designer... and you'll feel so smart knowing you didn't have to pay designers' lofty hourly fee to get those professional looking results (especially considering that some designers purchase the Cheat Sheets™ to use with their clients - because not all of them specialize in paint color and need the help, too... but shhh! It's a secret!). P.P.P.S. Just imagine how much easier home painting projects (and your life) will be now - without the stress of dealing with too many color options, the fear of making a color mistake or the disappointment (and expense) of having to repaint because of a wrong color! "Works for All Decorating Styles." This is a great product for people who get stuck and suffer from analysis paralysis (that used to be me). My only concern was: will the colors work for my home? But as it turned out, the colors work for all decorating styles. I know because my sister in law borrowed the Cheat Sheets™ from me (after she saw my freshly painted bedroom), and she is just as happy with her results as I am with mine (I have a traditional European theme going on here, while her home style is very minimalistic/contemporary). I don't see why the Cheat Sheets™ won't work for other styles as well. They offer enough colors to satisfy any taste, in my opinion. Plus, the bonuses alone are worth the price. So thank you, finally someone took the pain out of painting! I am telling all my friends about it (although I should probably keep this decorating secret to myself for once). For most of us, this is a “heart-sink” moment. Just thinking about all the different colors, how to match them and get a perfect result gives most of us a headache. There’s just too much choice! Added to that, there’s the creative names that paint manufacturers think up for their color palettes – no simple red, green, yellow or beige – oh no! Get ready for Delicious Melon and Euphoric Lilac to name but two choices! Well, now there is a simpler option available – the Paint Color Cheat Sheets™! By just reading a few simple pages of popular colors, you can choose like a pro and even color-coordinate with ease. The hard work of choosing is made a lot simpler by this product. You’ll still have some creative paint names to get your tongue around but, hey, nobody said a simple life should be a boring one! When I first saw this product and heard that it retails at $47, I thought “yeah, another attempt to get money for nothing”! But in fact , although the product looks simple, a lot of thought and experience has gone into making it practical, quick and easy to use and packed with great color ideas. In essence, with only a little time invested, you can make sensible color choices for all your interior rooms and even difficult items like front doors. I really liked the fact that color ideas were grouped in simple groups like reds, blues yellows etc. and that each color recommendation came with ideas about how to color-coordinate, and even ideas about which type of room/living space would be optimal for that color. In addition, there is advice on Light Reflectivity for each paint choice, which is important thinking about the ambient light energy level in each room. It’s also nice to have the “bonus” sheet ideas for Kids and Nursery rooms too, so now we can all be a bit more creative than just straight blue or pink – go for it, express your individuality! So I expect you realize that I like this product – yes, I do! At $47, it may seem a large outlay but you have to balance that against the time you save in using these ideas, and I have to say I personally liked the recommended colors. "Wow... the Fear of Selecting Paint Colors has Just Been Eliminated." As a Realtor I am often asked for decorating suggestions. I always say the biggest decorating bang for your buck is PAINT... hands down! Homeowners are often at a loss when selecting a color for their rooms. Many Realtors go for the safe answer and say "neutral". However when done right, color is what will set apart one home from the next.... from ordinary to Wow! You don't have to be afraid of color ever again. Now there is a fool proof way to go through this process with the confidence that you'll have a positive outcome. Easy to use and the insider tips will save you money. I especially appreciate the information about Light Reflective Values and what colors go with what. Everything you need to know but didn't know to ask is all spelled out for you. The Cheat Sheets will get you started on your way to a beautiful home, making it fun and easy at the same time. So many times clients waste time and money because they made the wrong choices but now that doesn't have to be the case. I will recommend this product to anyone that wants to save time, avoid mistakes, save money and get the job done right the first time. Everyone can have a professionally decorated look that can make a huge difference. Thank you for offering your extensive knowledge and research on the subject of painting and color selection. "Guys, You Can Use This System to Impress Your Wife!" Have you ever entered a paint store and seen that gigantic rack of color choices? It can be quite overwhelming. That’s why I was so excited to learn of the "Cheat Sheets" Concept developed by Yelena Kublitski. By having this proven system at your fingertips, you can save a lot of time, and then use the extra time to enjoy your home and family. The Cheat Sheets Concept is easy to follow and offers great advice and an array of proven colors to beautify any room in your home. But don’t just take my word for it, check it out for yourself and you’ll see exactly what I’m talking about. Having known Yelena Kublitski for several years, I can attest to her artistic vision and passion for color coordination and decorating. Using this proven system will go a long way in beautifying your home and impressing those who enter it. With the Paint Color Cheat Sheets, you can rest assured that you have chosen the right colors. "It’s Like Money in the Bank When You Get the Color Right the First Time"
After helping someone renovate a home, we got down to the fun part – decorating! Or so I thought it would be fun… until my friend couldn’t settle on paint colors and she would not listen to suggestions. We struggled through several rooms and finally gave up. Then I found the Cheat Sheets. Wow! Rather than focusing just on the color the eye “sees”, we were able to also read what the color would do in various situations. The suggestions on which room to use the color in, if a special primer is required and what colors to pair it with really helped. My friend easily eliminated colors based on the descriptions and we eventually settled on a color. We purchased the paint, painted the room and she was happy! The Cheat Sheets are well worth the $47 cost. You will recoup your costs the first time you pick paint and find you are happy with the results. And every time you use the Cheat Sheets it’s like money in the bank when you get the color right the first time. "You will Achieve Professional, Designer Quality Results." This new foolproof product will take the fears and insecurities out of your being able to use color in an effective and tasteful manner. The charts, cheat sheets, color illustrations, guides for coordinating decor colors and lighting make it next to impossible to not pick the right color for each room. All the hard work has been done for you. Basically, all you have to do is pick your favorite color and paint. The results you will achieve are professional, designer quality results. I personally would recommend this product 100%. How can one go wrong knowing what colors to place in certain lighting situations, what trim and accent colors to use with their wall colors, how reflective each color is, and what room best suits each color? All the work has been done for the homeowner. This is a wonderful product that I myself, a professional designer, refer to from time to time when I am stumped or on the fence about a color, room or lighting scenario. I give this product an A plus! "Great Idea That will Easily Pay for Itself." Great color choices for every room. This is a great idea that will easily pay for itself. The biggest problem we have as professional painters is helping our clients choose “that perfect color”. Many hours and quarts are wasted each year trying to achieve this elusive goal. I can easily see the Paint Color Cheat Sheets™ cutting the time it takes in half and having even happier clients. What you will find is more than a few simple color choices. These colors are by far the best of the best for both looks and coverage. Plus Yelena has also included suggested colors for accessories (fabrics, art, etc.). This will make your life soooo much easier to get that perfect room from start to finish. Copyright © 2017 HousePaintingTutorials.com. All rights reserved.